Luna was the Bead of the Month for May and some people received the darker, oxidized finish but mine is the more common silver. It is absolutely stunning. 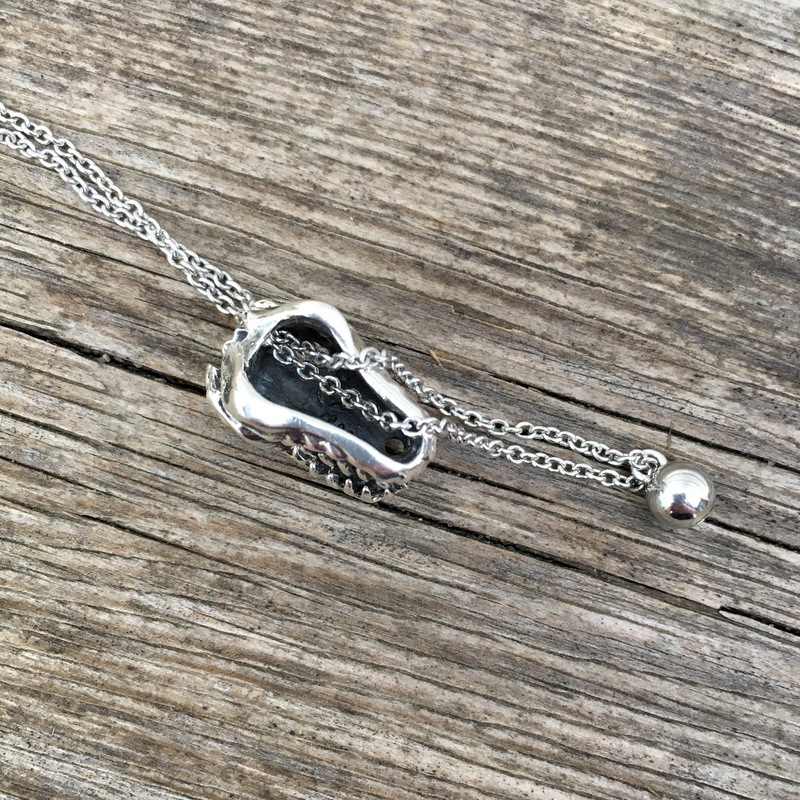 I believe it sold out almost right away, so this is just a post to show some combos, plus I wanted to show how the Ball Necklace works, in case anyone is not sure. 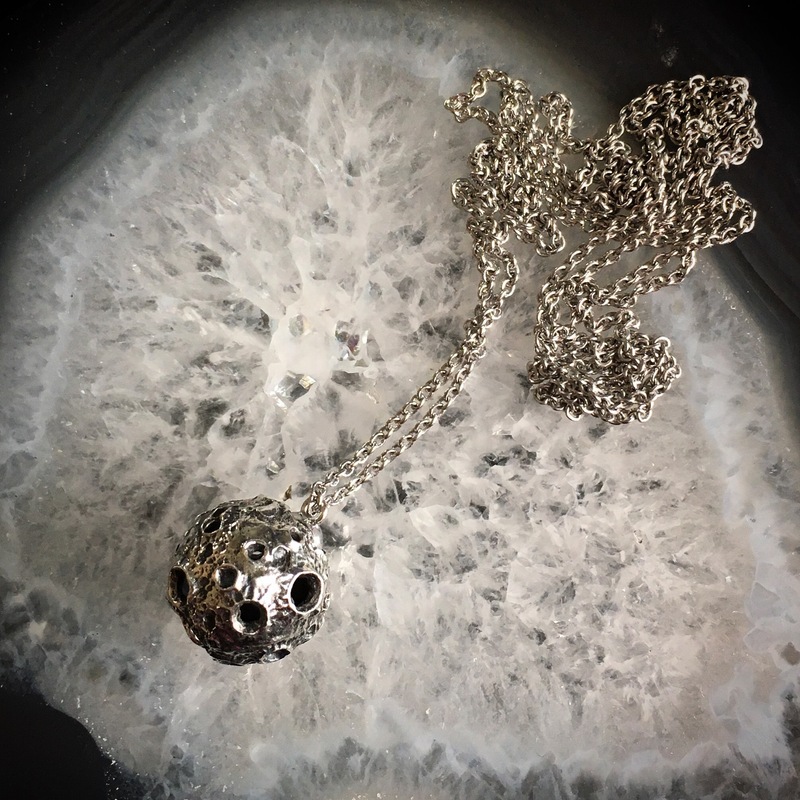 The Ball Necklace was made for the Rawr series of dinosaur skulls. 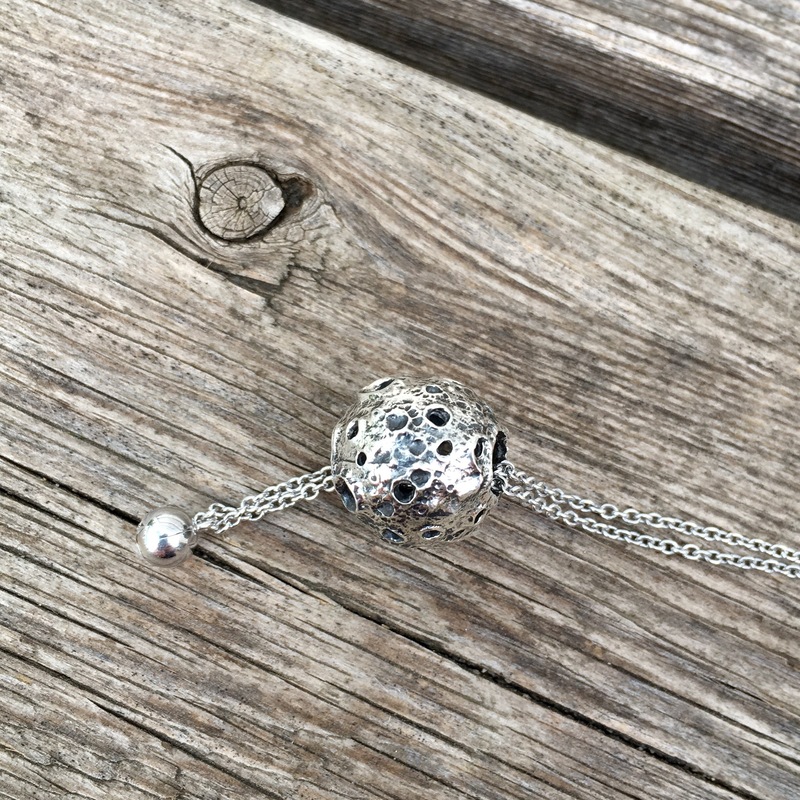 You pull it through a big opening and then the ball stops it so the bead hangs really nicely. It’s about 70cm long. This T-Rex is one of my all time favourite beads. The teeth are really cool. For the Luna, you just thread the chain through the biggest opening. I have a really bad spatial sense, so have to think about it each time. When it’s through, it hangs so nicely. It was an important part of my combo on Monday this week for work. Many kids said how they liked my bracelet and necklace. One class also clapped for me as I walked in the room with my banjo. How often does that ever happen? Lol!! Here’s a combo I really like as it makes me think of outer space. The blue beads are called Hong Kong Skyline and are Trollbeads, but were limited edition and are hard to find. For this bangle, I was thinking of an earthy style, with the dinosaurs going extinct due to an asteroid sending up an ash cloud. And I was trying to balance the sizes. The middle bead is called Humerus. Everything on this bangle is Ohm-Earth-ish Stoppers and Bolly Wood beads on the Twisted Bangle. So, I wore Luna mostly on the necklace this week, but today am wearing it on a bracelet. 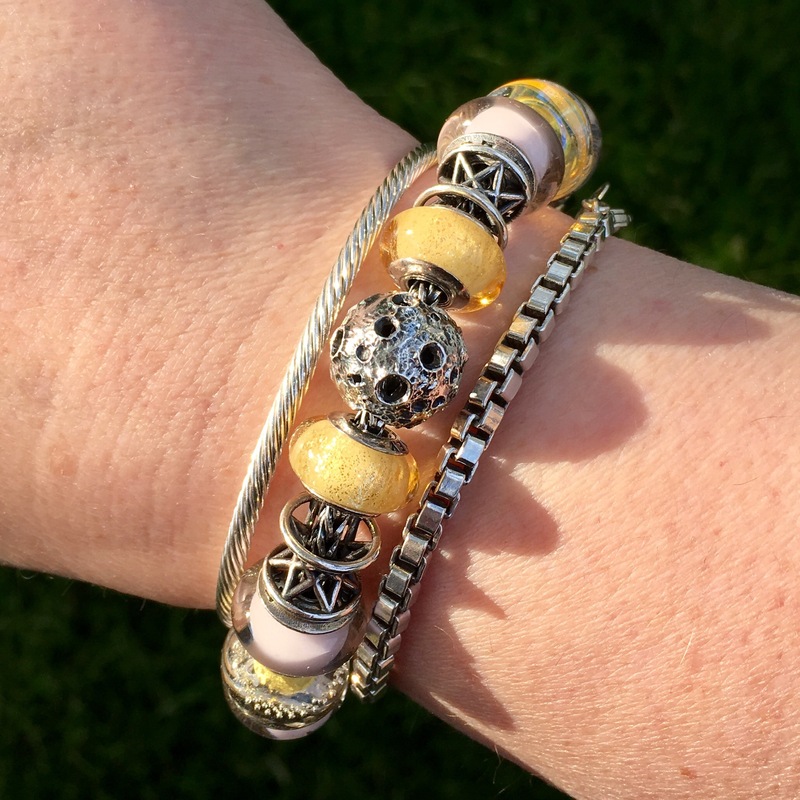 I’ve used a mix of the Disney Pandora Belle Muranos, Trollbeads Smile of Stars silver beads, True Beadz in Baby Pink, Trollbeads Honey Dawn and Gold Silver Trace. The brass stoppers and Heart Love Lock are Redbalifrog. 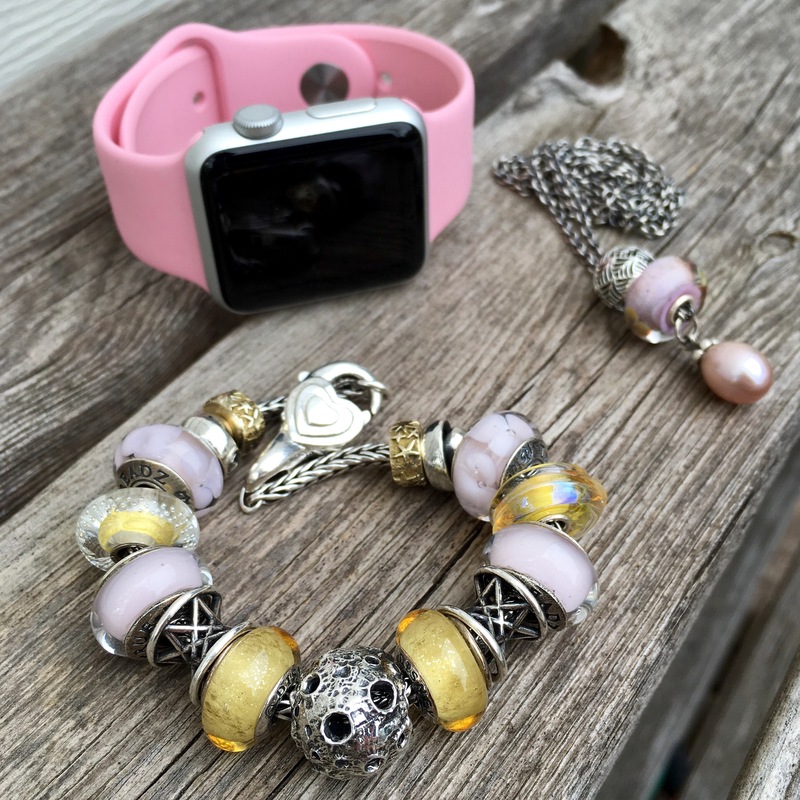 And here’s the whole combo with the Trollbeads Rosa Pearl Fantasy Necklace and my beloved pink Apple Watch. 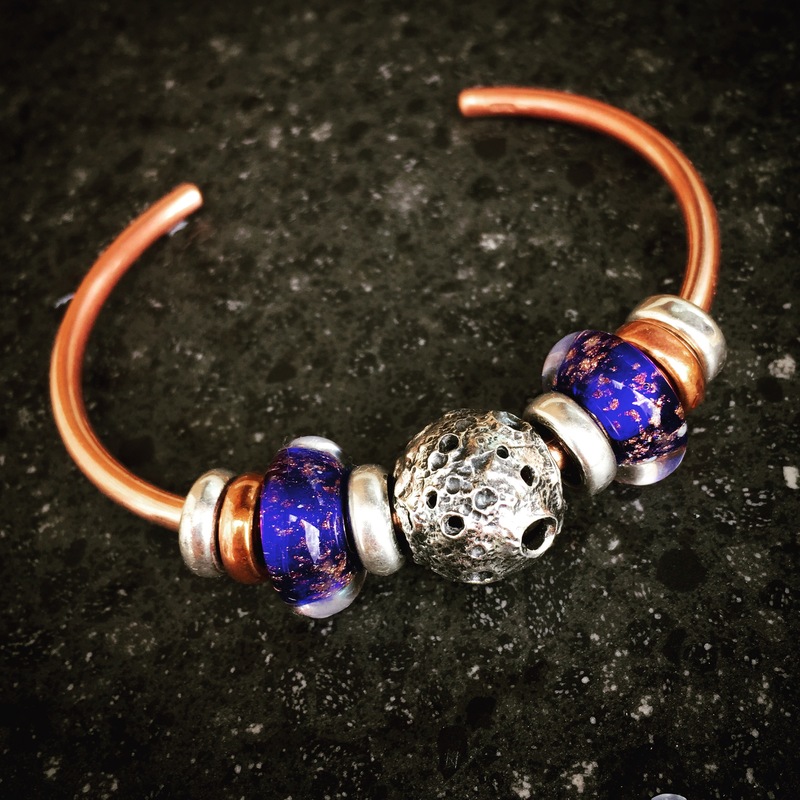 On the FN are Pandora’s Tropicana silver bead and the Trollbeads Wild Flowers glass bead. The giveaway is still open, encourage your friends to enter! Will announce a winner Friday morning! I was lucky enough to obtain a Luna (mine is the lighter one, which is the one I was hoping for), and I absolutely love it. It’s a truly stunning piece, being a nice size and with amazing detailing. It looks wonderful on the necklace you show here. I may have to consider getting one of those! I’ve been wearing mine on my Troll bangle, surrounded by two each of the Troll Sahara Night, Elf Starwheels, and Elf Air Fractals. I may try to do something more colorful this weekend, though. 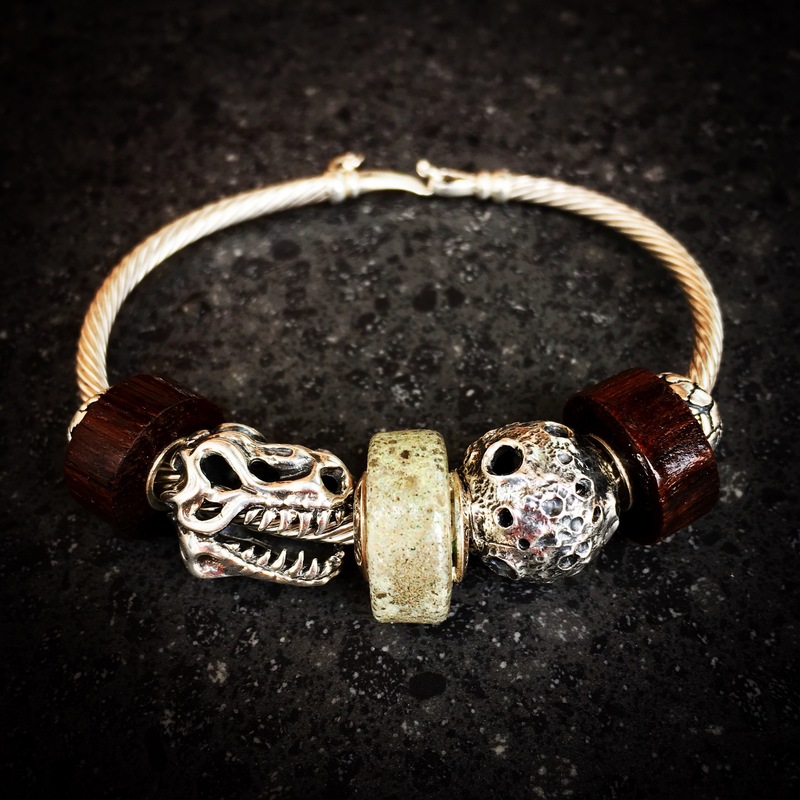 By the way, the T-Rex skull bead is amazing too. I’ve been wanting one for a while, but keep asking myself what I’d do with it. I’ll probably give in at some point and get one! Your bangle sounds lovely, Kim! 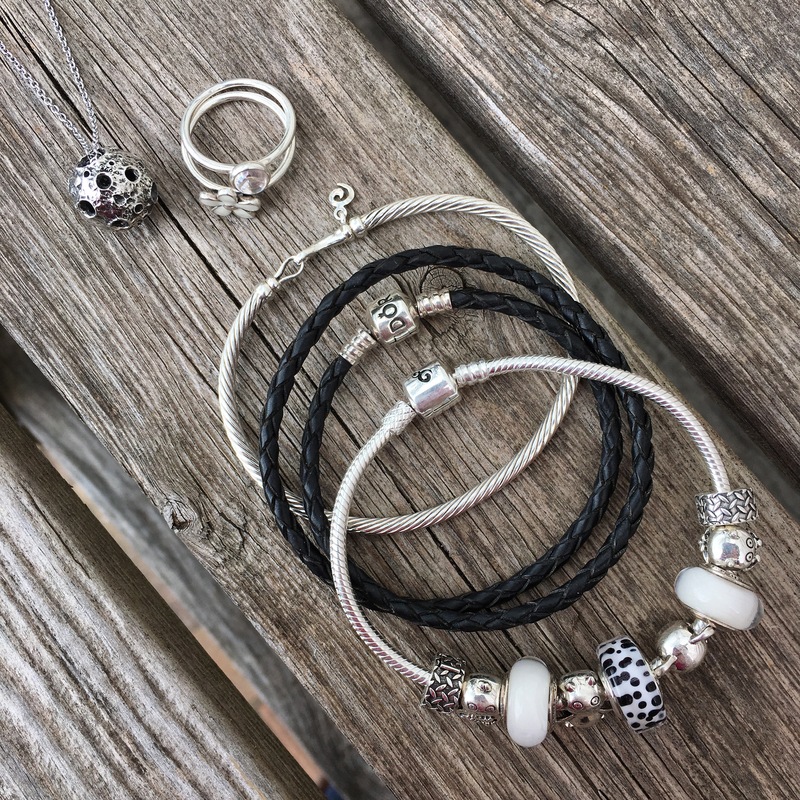 It’s such a great focal point for a bracelet. The T-Rex is so much fun. I also wear it as a necklace quite a bit. I really like the lighter version of Luna, having seen many images on IG, and love it on the neck las because you focus on its beautiful detail. I also like how large it is in comparison to your others beads. Lovely photos on your blog today as always, I love to start my day looking at so much beauty. And, you must be a great teacher and the children are sweet to clap for you. Have a great day Martha! Thanks Sarah, have a great day yourself! I’m also happy I got the lighter version. I like how it’s shiny but then you can see the darkness of the craters. Wow! 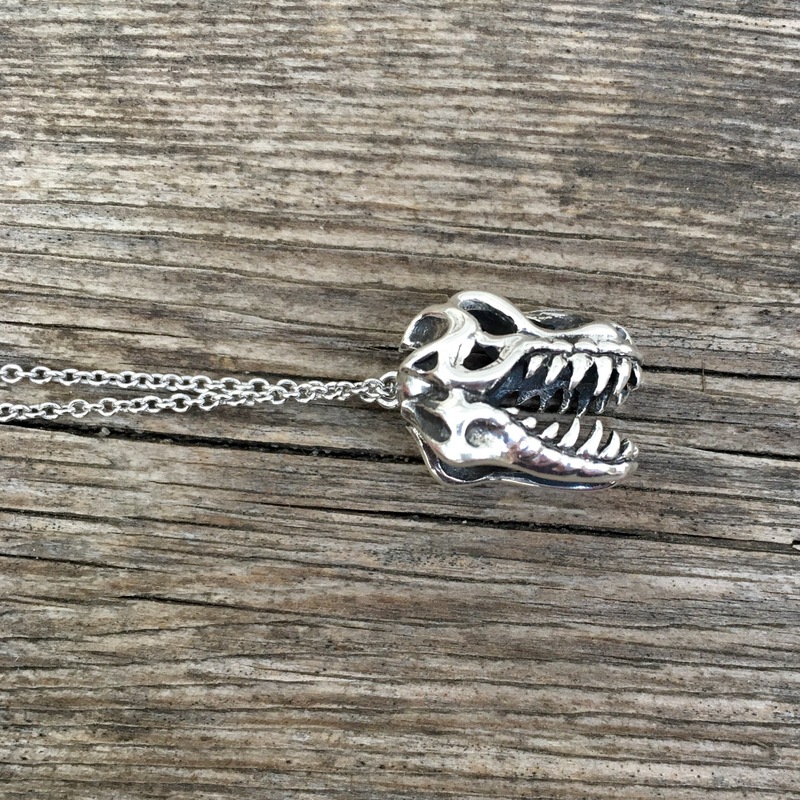 I need to get the ball necklace now and a couple of dinoskulls (velociraptor is my favorite). Great pictures as always! Lol! Thanks April! Ooo…the velociraptor is really cool! Rawr (T-Rex) is awesome too. The details are so nice! I missed out on Luna, and it is a fabulous bead. I like it best on the necklace. The moon is beautiful and also stark and shines brightly so it looks alone in the sky. I think the necklace brings out the cold beauty of the moon. What a lovely description, Debbie! I was looking at a photo for tomorrow and that’s exactly what it looks like-all cold but beautiful amongst some warmer tones.